It’s now been two months since I had my bariatric surgery and I’m still struggling with some food issues. However, being Foodie Friday, I thought I’d write about some of the wonderful meals I’ve been enjoying. First let me state that the secret is to use small plates. Yes, not the regular dinner plate, but the salad or dessert plate works best. This creates the feeling of a large amount of goodness while maintaining portion control. I know this works because I made an amazing grilled smoked pulled pork, baked beans and coleslaw party and still managed to drop another 5 pounds. 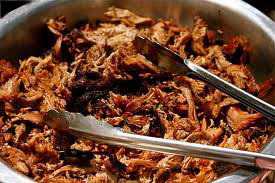 Below are the recipes and directions for the beans and pork. Howard’s Baked Beans: Howard is my older brother and these baked beans are the easiest and best tasting I’ve ever had. There are lots of ingredients, but it takes just six simple steps to create. 3. Add the chili sauce, maple syrup, water, rum, vinegar, Worcestershire sauce, mustard, curry powder, salt, and pepper to the skillet and bring to a simmer over medium heat. Cook for about 2 minutes to blend flavors. 4. Put the beans in a casserole. Pour the sauce over them, and stir gently to combine. The beans will look very soupy at this point, but the sauce thickens a lot as it cooks. 5. 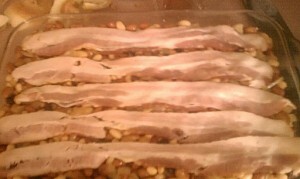 Lay 3 or 4 strips of bacon over the top of the casserole and place in the preheated oven. 6. Bake for 1 hour, or until the sauce is bubbly and the bacon is cooked. That’s it. You can make them a day ahead and they get better with time. The secret to smoking on the grill is keeping the temp. low and the wood chips replenished. barbeque sauce (make your own or buy favorite brand). 1. Coat roast with dry rub, cover and put in fridge (give it at least 8 hours, but 24 works best). 2. Take roast out and let stand for 30 minutes to reach room temp. 3. Soak the chips for at least 30 minutes, drain. 4. Pre-heat your grill using either an indirect element or just one burner, getting the temperature up to only 225-250 degrees. 5. Put 1-cup of the soaked wood chips directly on the heat source; put roast in roasting pan, uncovered and place on the unlit portion of the grill (indirect heat), close grill cover and leave it alone. 6. Once an hour, or as needed, replenish the wood chips. Smoke the meat for 4-5 hours or until the internal temperature reaches 190 degrees. This is crucial…190 degrees, no less– so invest a a really good instant read thermometer. There will come a point at about 160 degrees when it seems like the temp just will not get any higher, be patient; it will stall for about an hour and then start to rise quickly. When the roast is done, remove from grill and let rest for 30 minutes or until you can handle it. Remove the crusty fat, chop and reserve. 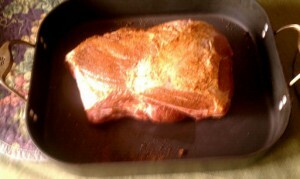 Then begin pulling the pork off the bone placing into a large dutch oven. Add the chopped up crusty fat, 1 cup of barbeque sauce and put on stove top to heat through for 30 minutes. Serve with coleslaw, beans and a good beer. Yummm! I fed 9 hungry people, buffet style with make your own sliders and had left overs…It was a perfect way to ring-in summer! Who said that bariatric surgery meant you can’t have your pork and eat it too! ENJOY.